By now you’ve likely heard news that this year’s SEMA Show  is tracking at near-record levels. When the Show opens October 30, we’ll have more than 2,100 exhibiting companies, 1,500 custom rides, close to 1,800 new products in the Ideas Alive  showcase and more qualified buyer attendees than ever before. The SEMA Show is once again set to deliver the best of our industry’s innovative genius gathered into a single, highly effective marketplace. We’re shining a spotlight on “Innovations of Generations”—celebrating the accomplishments of our past but also highlighting the advances and innovations being led by our younger industry members. If you are a supplier in the $30 billion automotive specialty-equipment market, it is important to have a complete understanding of why standardized, well-distributed product data is critical to business growth. The bottom line is to sell more parts, right? Well, in this age of instant information and aggressive competition, it’s going to take more than “the way we’ve always done it” to succeed. Consumers are becoming more and more accustomed to having information at their fingertips, and the competition for their money is tougher than ever before with the myriad choices available. As a buyer, you realize that the annual SEMA Show in Las Vegas is the world’s premier automotive aftermarket trade event—and you wouldn’t miss it for the world. Yet with so many business opportunities concentrated under one roof at the Las Vegas Convention Center (LVCC), how do you make the most of your Show experience? It’s not easy to cover more than 1 million sq. ft. of products, exhibits, display vehicles and special events in just a few, short days. With the Show rapidly approaching, now is the time to get organized and establish your game plan. Here are eight insider tips to get you started. Industry professionals from across the country and around the world will gather at the Las Vegas Convention Center from October 30 through November 2 to learn about the newest releases in automotive specialty equipment. There, they will make business connections that will bring innovative products to consumers during the coming year. Many of the products to be introduced by the approximately 2,000 exhibiting companies will be showcased on the vehicles for which they are intended. For the past few years, SEMA News has previewed dozens of these automotive artworks, and we’ve renewed the tradition once more for 2012. Enjoy a foretaste of the 2012 SEMA Show feature vehicles in the following pages, and get ready to see many more in Las Vegas! Constructed last fall to the finest detail, these miniature pinewood hot rods were the brainchildren of 15 of the nation’s best custom-car and hot-rod builders. The hot rods could be mistaken for the real thing if only they weren’t small enough to fit in the palm of your hand. But they came to life as they raced against each other to benefit two children’s charities at the third-annual Hot Rod Industry Alliance (HRIA) Pinewood Builder’s Challenge during SEMA’s Installation Banquet & Gala Fundraiser, July 27, at the Sheraton Fairplex Hotel & Conference Center in Pomona, California. The cars will be autographed by the builders and will be displayed in the HRIA booth #23395 at the 2012 SEMA Show. Two of the biggest names in the automotive world are teaming up again, this time with Source Interlink Media, to build two trucks that will benefit good causes and to create new, limited-edition WD-40 Smart Straw cans that feature some of Chip Foose’s classic vehicle designs. time. Visit www.SEMAShow.com/discounts  to ensure that you take advantage of every offer! As the 2012 SEMA Show opens its doors, the world’s eyes will be focused on the final days of this year’s contentious election campaign. Candidates across the country are making their closing arguments to attract any undecided voters who may still have a chance of affecting the final outcome. Enhance and streamline your 2012 SEMA Show experience by using the newly created SEMA Show app for smartphones. Attendees can use the free, innovative digital resource to navigate the Show floor, locate exhibitors and plan for education sessions. The new app even allows users to search for exhibiting companies by product category and then communicate with them to set appointments. The SEMA Mustang Build—Powered by Women, launched by the SEMA Businesswomen’s Network (SBN), spotlights women working in the automotive aftermarket and encourages women to pursue careers in the industry. Ford Motor Co. donated a ’13 Mustang GT for the project to be modified entirely by SBN members. Kick off the 2012 SEMA Show with award-winning automotive designer and television celebrity Chip Foose and the 2012 SEMA Show New Products Breakfast, Tuesday morning, October 30, in the Las Vegas Hotel. As keynote speaker for the annual breakfast, Foose will share stories and inspire attendees as the SEMA Show’s New Products Awards are announced and presented. Moving indoors at 7:30 p.m., the party continues with comedian Christopher Titus performing throughout the evening. Titus, who currently has three one-hour specials running on Comedy Central, starred in a self-titled sitcom on Fox called “Titus.” The show earned Titus a Writer’s Guild nomination as well as an Emmy nomination. Car Guy Nation and more. Cadillac ELR Prototype, Buick Cabrio, Dodge Durango and Jeep Grand Cherokee SRT8. On behalf of the Tire Industry Association (TIA), I would like to welcome you to Las Vegas and to this year’s Global Tire Expo—Powered by TIA! We hope you find everything you need to make your business a stronger and more dynamic enterprise. It’s hard to believe, but here we are again in Las Vegas to showcase the work of our family members from the past year. The SEMA family consists of everyone on the Show floor and everyone back home that made all this possible. When you enter the Show you will see only a glimpse of the automotive specialty parts world, which is far larger than even the Show itself. However, the dedication, passion and vision of the entire SEMA family is plainly evident, concentrated into one week in Las Vegas. It’s a view of the future that we are proud to present. 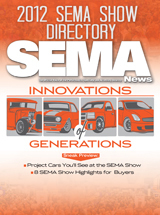 Click here for more pricing information or to download a copy of the current SEMA News rate card .